Renold Couplings’ RBI range designed for industrial applications. Renold Couplings’ RBI range has been designed with both staff and machinery protection in mind. Torque is transmitted through compressed rubber blocks, which dampens vibration and eliminates backlash. When rubber is loaded in compression it is stronger than alternative options, such as rubber-in-shear, or tension, which can lead to tears and machine failure. Finite Element Analysis (FEA) was conducted, in order to try to create an optimum shape for the rubber blocks, which aimed to increase the torque transmission. This new block shape is manufactured from a new rubber compound. The FEA indicated that the combination of this new block profile and new rubber compound would allow for higher torque. Subsequent testing of the RBI found that the torque rating has been increased by 50%, compared to its predecessor. 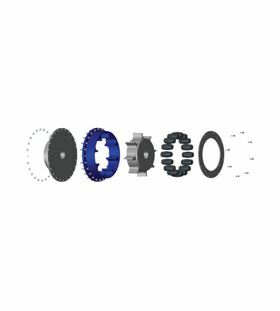 RBI rubber-in-compression couplings by Renold Couplings aims to increase safety and reliability for customers.